Every so often, my local Home Depot surprises me. Over the years, I've found it to be a decent place to find common houseplants, but not the place to go for anything exotic or out of the ordinary. 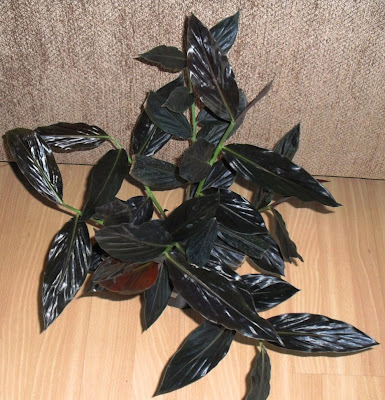 But last week I found this plant, labeled, of course, as a generic "Tropical Houseplant"
I've had one of these before, and it didn't fare all that well. Alpinia, and its relatives in the Zingiberaceae, (ginger family) like a lot of moisture, and wilt and shrivel and carry on if they don't get it. My first specimen was very small (only a few leaves) and wasn't vigorous enough to put up with my tendency to underwater. 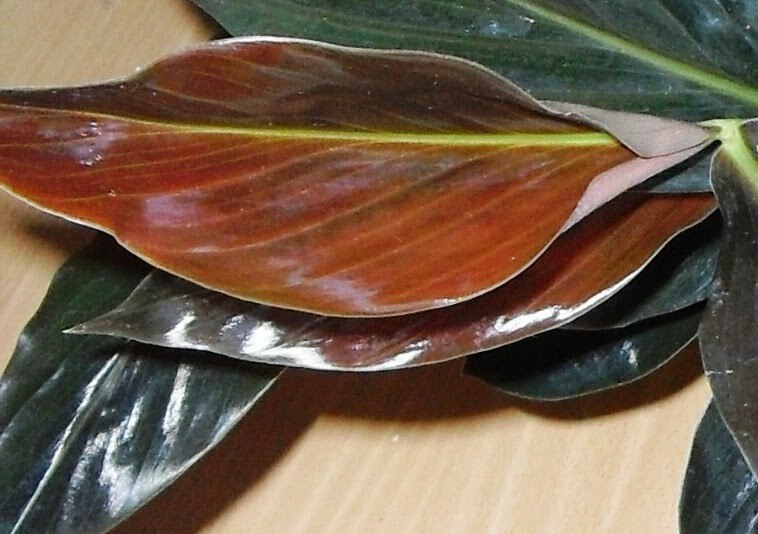 (My Alpinia zerumbet variegata, which was kind of large when I bought it, has flagged and bounced back a few times, after I cut off some pretty ugly old foliage. It's looking pretty good now.) I'll try to be more careful with this one. If Luke had posed, I would have had a nice black and orange shot for Halloween. Also, a ginger cat with a ginger plant would be a nice visual pun. But the constant doorbell ringing from trick-or-treaters has scared my shy orange boy into hiding. 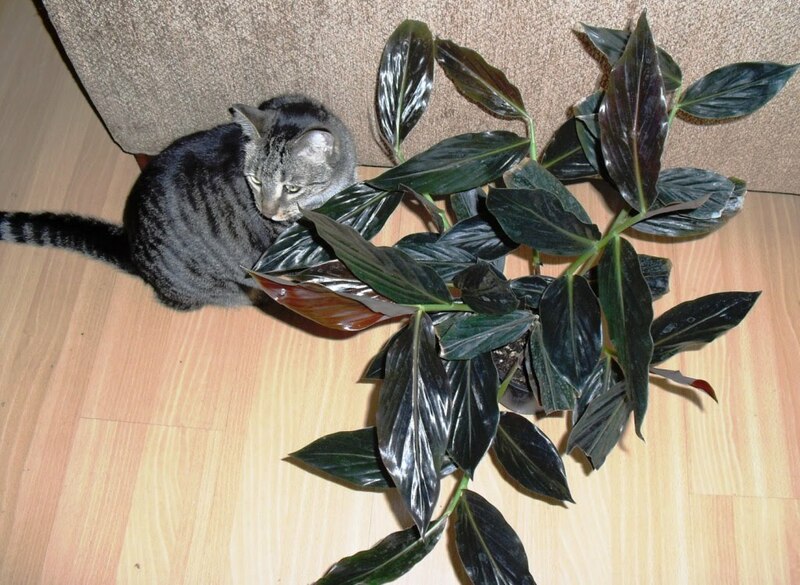 The ever-intrepid Peppermint obliged by sitting next to the plant. but the effect is not quite the same. Gorgeous plant. I love the dark and redder shades. Thanks for sharing. Now I just have to find one of my own! Beautiful plant, and Peppermint is really cute. I feel the same way about Walmart as you do about Home Depot: Most of the time their plant offerings are simply pathetic and then every once in a while I find an absolute treasure in great condition and at a ridiculously low price. I've had mine over a year now, and I'm really happy with it. (Sort of ongoingly baffled that the ex-job hasn't managed to sell the rest of them, actually.) If I notice it's getting too dry, I up-pot, and that's worked fine for me so far.